I saw an adorable gold sequined initial for sale on Etsy, for like $30. And the DIY-er and frugal person inside my head said, “Hey, I can do that!” So here’s my attempt, and some suggestions on how I would do it differently next time. Sequins of your color choice – Here’s where I would change what I did. I bought a sequin ribbon type thing, which worked, but it was very expensive (I did use a coupon though), and didn’t come with that much. The letter I go was maybe 8″ high and I could’ve easily used 2 of the sequin ribbons I bought. So next time I’d either (a) buy 2, or (b) possibly buy loose sequins that are cheaper, but would be more time consuming to attach. 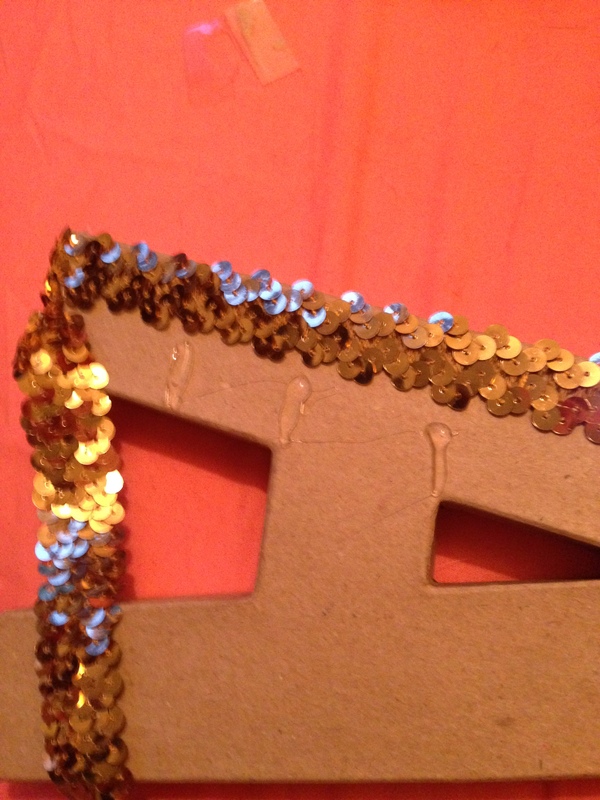 From there it’s simple – hot glue the sequin ribbon onto the letter. I stretched the ribbon quite a bit, and tried as best as I could to wrap around the edges so when it was hung on the wall there weren’t any bare spots. I literally glued a straight line onto the letter, then stuck the sequins to it. Only burned my fingers a couple times! It’s that easy! I ran out of sequins before I was completely done, but it’s covered well enough that from the middle of the room you can’t even tell – you’d have to get up nice and close to notice (one good thing about a tan cardboard letter vs. a black or white wooden letter). Thanks! The deer is my favorite I think! 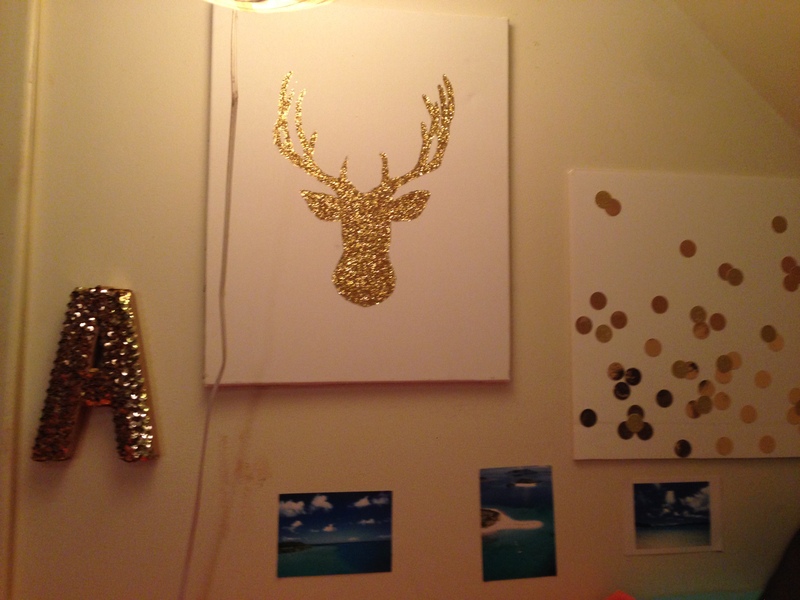 And I’m loving slowly converting my room to a gold and white theme!